This is what I have made for my mum this year. Oooh thats pretty. Lucky Mummy! That's so pretty, Alison: definitely up my street! Lovely, the soft colouring of it is really pretty. lovely - it looks embossed, is it? 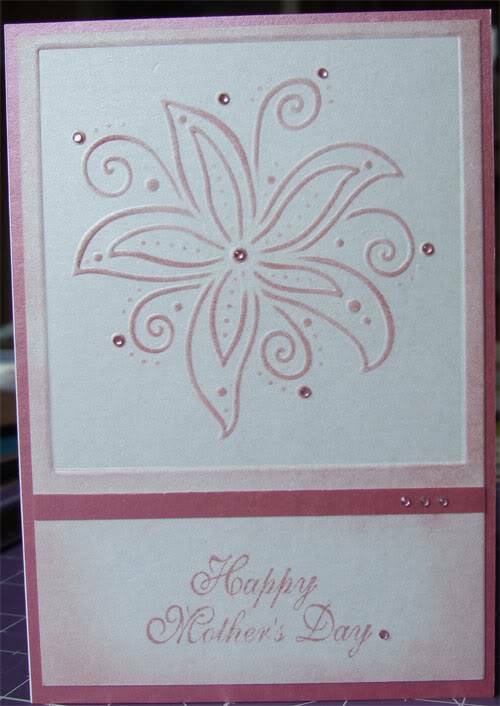 Yes Maria, its a pink stencil and then colourd with distress ink, Victorian velvet, word's are a stamp using the same ink, strip of the matting paper across and tiny gems. I think there will be a few of these made cos I like how it turned out. Very nice, liking the bit if sparkle.